World's Tourism Day will be marked on September 27th, globally, with the slogan 'Tourism for All'. 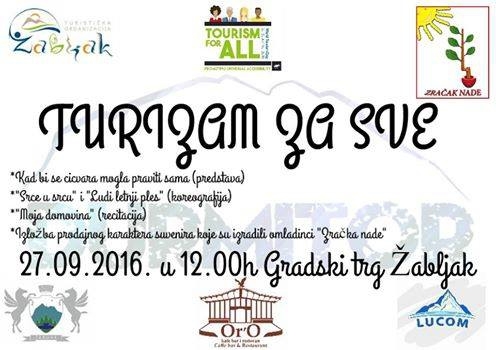 International Tourism Day will be marked in Zabljak municipality, with the special accent on the youth of this city and wider region and with the idea to include parents with the children with disabilities, elder citizens and persons with disabilities, so everyone can have the same conditions in the travel industry, offers and services. - hymn performance of the NGO 'Ray of Hope'. The children from NGO will prepare their own hand made souvenirs, which will be available for all the visitors on the stand made for it. Manifestation will start at noon on the main square in Zabljak.